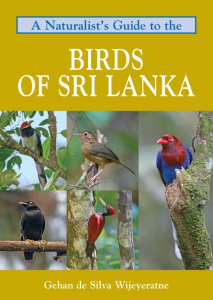 This easy-to-use identification guide to 280 bird species covering the most commonly seen in Sri Lanka is an ideal, portable guide for residents and visitors alike, written by an experienced birder with a track record for writing to a popular audience. The author’s top quality photographs are accompanied by detailed species descriptions, which include nomenclature, plumage, distribution, habits and habitat. The species accounts cover 75 of the 82 families of birds recorded in Sri Lanka and distinguish between highly scarce migrants and vagrants to explain what a realistic and good ‘country list’ and ‘trip list’ would be for residents and visitors respectively. The user-friendly introduction covers bird topography, bird orders, a novel photographic summary in taxonomic order of all 34 endemic birds that are key target species, and the main sites for viewing the listed species. Also included is a checklist of all of the birds of Sri Lanka encompassing, for each species, its common and scientific names as well as its national status.